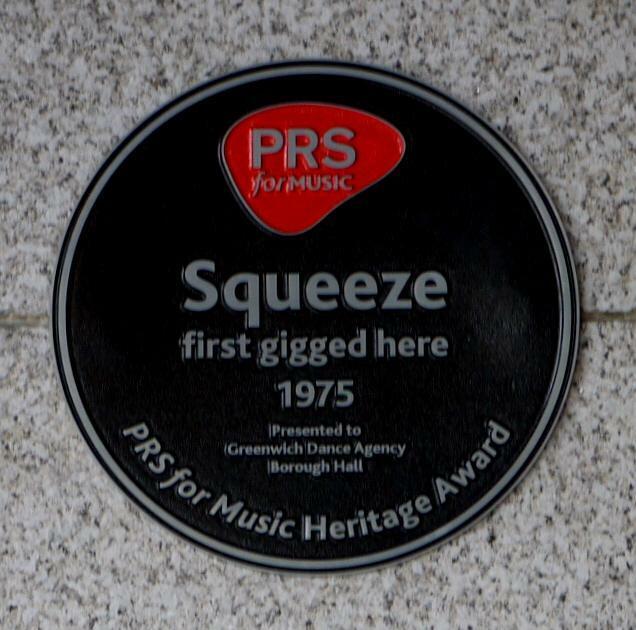 Squeeze first gigged here, 1975, presented to Greenwich dance agency borough hall. Present at the unveiling: founding members Chris Difford and Glenn Tilbrook. 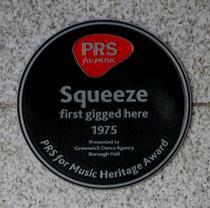 After the plaque was unveiled by members of the band, it promptly disappeared. Trophy hunting was suspected, which would have been particlulary daring as there is a police station literally feet away. It transpired that the Greenwich Borough Hall is a listed building. (hard to see why from the outside, but it does contain some art deco features). Greenwich Borough Council gave permission for the plaque to be erected temporarily, on condition that it was then taken down awaiting planning application. The plaque was re-erected some time in February 2011. It was originally in a prominent position on the side of the building, but is now stuck next to a fire alarm.